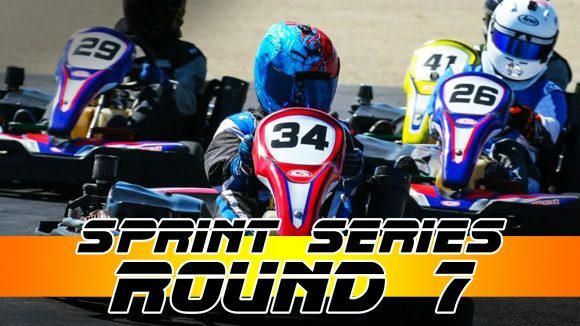 The second half of the Sprint Series season begins this weekend with the hottest temperatures of the year, rightfully kicking off the Summer Series sub-championship as well. Sportivo will be the stage for the seventh round in the championship, and it will be the first shot at it for series newcomers as it was rained out back in March. Now with scorching temps on the docket for Saturday -solidly into the triple digits- drivers will battle both the elements, and the track to come up with a good result. This was supposed to be the second time this season that the Sprint Series drivers were to take on the Sportivo layout, but with round #3 getting postponed due to rain, this weekend will be the first time that some will see this challenging course. Several Sprint Series regulars actually took to the Super Series in the month of March, so Sportivo shouldn’t be completely new to the sharp end of the field. The weather is obviously a stark contrast this time around as well, and the upside is that the grip level will be higher than what we see in the Spring. The apex for Sportivo is actually the last part of the curb, and not the first part. Many drivers will look at the leading edge of the curb on the inside, baiting them to turn in early, much like we do with the much faster approach to Nuovo. With Sportivo cutting back in on itself for a tighter than 90-degree radius, it is really easy to carry too much speed out on the exit. For many, moving your eyes from the apex to the far side of the exit curb helps, and it gives you a consistent point to hit every lap. This also helps in getting the timing right when picking the throttle back up sooner, as this corner is what creates opportunities for passes down into Monaco. While getting the braking for Sportivo right can be a bit tricky since it is off-camber, Monaco’s challenge typically lies in the fact the grip on entry is so low. We are going near top-speed on the entry, and need to brake to what is one of the slowest corners at CalSpeed. A driver’s ability to brake later and with more control here really pays off; not just in lap time, but in making passes stick. Aside from the left foot, the line is extra crucial here; it isn’t as wide open on exit as Long Beach. With how tight the radius is here, you have to make sure you are perpendicular at the apex; an early turn in can spell disaster in more ways then one. There are two points I want to bring up on passing for the Sportivo layout; positioning and control. Thinking ahead is always an important aspect of not just making the pass, but keeping it. By doing this well, we can ‘link’ corners and position ourselves in a more advantageous position to either capitalize on a mistake, or create an opportunity. Further, a greater understanding of how -and why- the lines are what they are through each corner can help us in maintaining our focus forward, while still making things difficult for those behind to get around. The way that Kornakurva blends into Sportivo, all the way through from where Monaco blends to Horseshoe are perfect examples of where this can be applied. The second thing is control; many drivers -especially in the Sprint Series- either lack control or at least finesse when making their passes. The contact or lack of holding their line is because of this deficiency, and it is something that can really hurt you on this track. While it is absolutely possible to go side-by-side through both Sportivo and Monaco, it becomes a much more dangerous proposition when there is no control. Remember, the kart doesn’t do anything until you tell it to; you have the controls. Use them wisely. This weekend will see perhaps the toughest events this year since the opening couple of rounds, as not only will we have [2R] drivers in attendance, but also an influx of talent looking to shoot for the Summer Series championship. As it is a best 4 out of 5 contest over the final five races of the year, the points start at zero, and everyone is tied for first heading in. 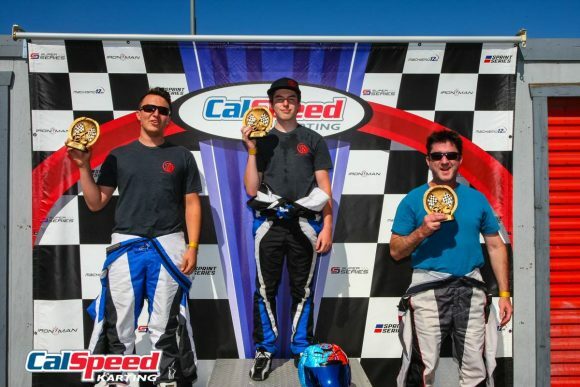 Season regulars and typical front runners like Russell, Hunt, and McKee will be joined by regular top step threat Diego Alvarado, and former Heavy Class Super Series champ Rodney Bryant, but also last year’s overall runner up Don Diego Veloria. Veloria scored multiple podiums last year, but has yet to snag that first win; a fact I am sure he’ll be looking to remedy this weekend as a [2R] competitor. Another [2R] driver that hasn’t been in the seat much at all the last couple of years is Bruce Allen; a former top 10 contender in the Super Series, if Allen can knock the rust off fast enough, look for him to make some noise as well. Last but not least I think we could see Kevin Erikson get back to form this weekend; the former regular front runner from last year knocked off his own rust in last month’s contest, and I think might be one to watch. Round 7 of the Sprint Series will be a tough day for many drivers, with over 100-degree weather and a track that we have not seen so far this year, Sportivo. 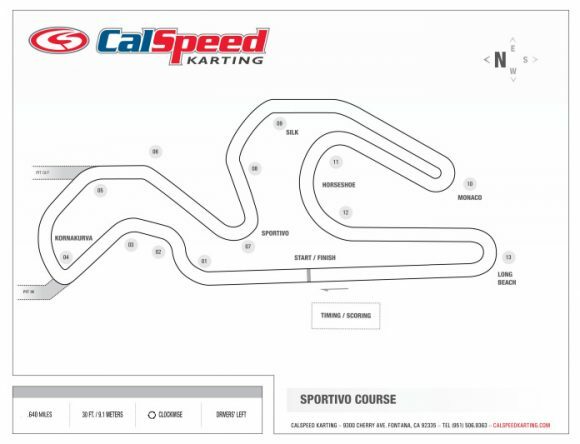 Although this layout has only two different corners from our previous race on Nuovo, the sections are big enough changes that can make you feel like you haven’t driven at CalSpeed at all. The Sportivo corner will see a lot of action this weekend. A late apex corner with a tight exit and an intimidating curb that comes up faster than you’d like. If you have ever asked Mike or myself about tips to getting around the track, you have had to heard us mention “vision”. The Sportivo corner is big on this concept as it’s really easy to get distracted on your approach. Many drivers get so caught up with trying to realize where to brake that their eyes are off the apex. Focus on your apex and be aware of how you’re exiting; that will explain your entry. Monaco is such a crucial corner, making sure that you can carry speed and be smooth will play a part for the rest of your lap. Being late to the throttle will only mean you’re that much slower through the Horseshoe and have less of a run into the final corner, Long Beach. This hairpin is very easy to overshoot and have a slide through the corner. 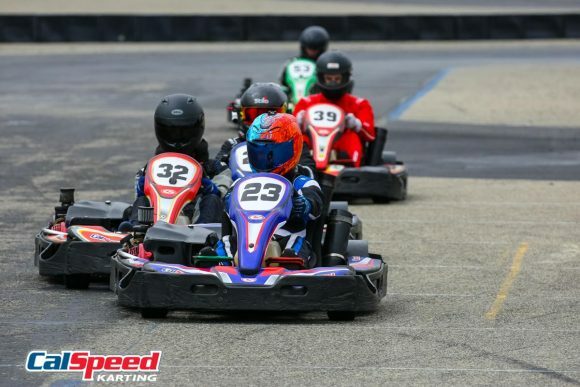 Even if you get back to the gas at the right point, the turn-in is more important and making sure that the kart is squared up as well. Quite a few times I had an early turn-in during testing and it is a night and day difference between that and someone who makes the later entry work. The track is quick and the racing is tough; the driver who is better on the brakes will have an advantage this Saturday. There are so many corners that can be used for passing on this layout, but that doesn’t mean you should. It is really easy to become carried away going for a position and not completing it; now you’re on the outside for the next corner. Just like Nuovo, you need to think about the big picture and make your moves stick. Be sure to check out the onboard video of Mike’s footage from testing this week. You’ll be able to see a lot of the do’s and don’ts of not only how to drive this track, but also race it. Stay hydrated this weekend, it is really easy to think you’ve had enough fluids when you haven’t. Good luck to everyone this weekend, see you at the track! 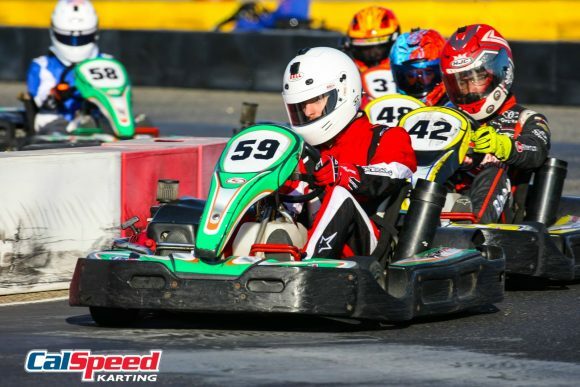 Spencer Russell really put a stamp on the first half of the season, not only by winning the Winter Series sub-championship, but by winning the past two rounds with perfect marks. He heads into the second half of the year with not only a 35-point lead on his closest rival, but the strongest drop as well. His consistency is certainly the foundation for his strong first half, but he also has not made many mistakes, making the most out of taking part in every clinic on offer. His closest challenger is fellow teenager Sam Hunt, whose raw speed has seen him at the sharp end all year, and is a big part of why he leads the Sportsman points in the Super Series. Hunt also has a win and another podium to his name, and is just needing a bit more consistency and patience to close the gap to Russell. The point gap is not insurmountable, and there is still plenty of racing left on offer. Behind the top two young guns is elder statesman among the top five, Randy McKee. McKee came up just short of the top three in last year’s Sprint Series, and is arguably one of the most consistent drivers in the heat races. Turning those heat race results into stronger Main finishes seems to have been his Achilles thus far, but his second highest drop in the Series proves his consistency. He leads a group of challengers against the top two, the 41-point gap to Hunt and the 66 markers from Russell providing him and the rest of the front runners plenty of work in the second half of the season. Summer Series Championship: Who can challenge the Winter Champ? Spencer Russell’s unmatched consistency saw him clinch the Winter Series title one round early, and his back to back wins to finish off the first half of the season see him as the de-facto driver to beat as we kickoff the Summer Series tomorrow. 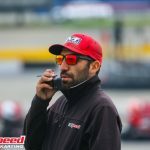 This time around he’ll have even more of a challenge, with several more drivers entering the fray that could be a certain threat for the title. Hunt is the obvious #2 guy after his win and podium in the first half, a fact bolstered by his success in the Super Series as the Sportsman class. Joining him from those ranks for the second half of the year is second in that category, Rodney Bryant. He showed quite well last month with a 2nd in his heat and a 7th overall, proving his is going to be a title threat right out of the gate. Previous winner this year James Lieser would love to get back where he was in first couple of rounds, and this sort of reset button could be what he needs to get back into the fold at the front.